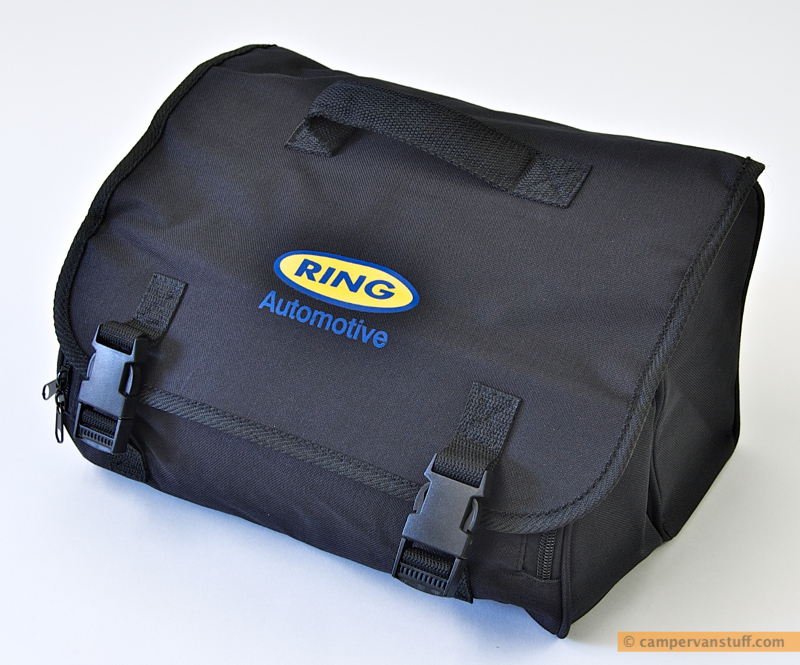 The Ring RAC900 Heavy Duty Air Compressor is a powerful portable 12v tyre inflator offering a high flow rate and pressures up to 100psi to inflate motorhome tyres rapidly and reliably. 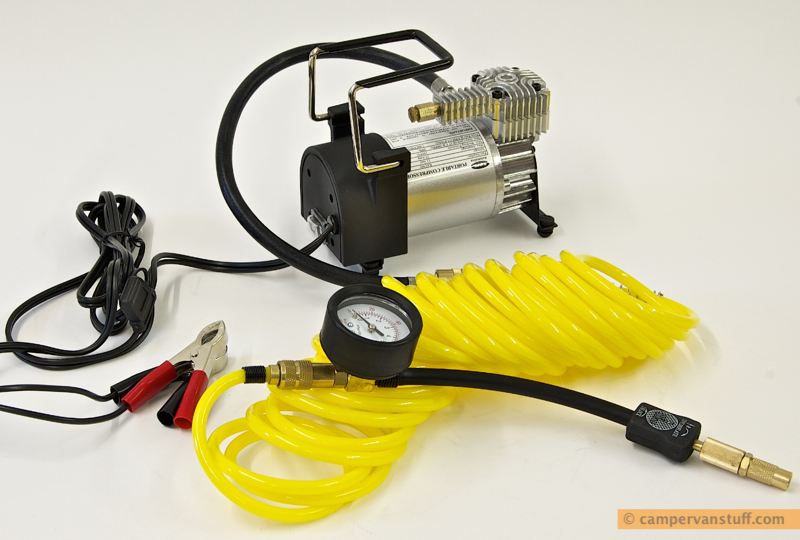 Its professional features include the high quality compressor unit, a long coiled hose which allows it to reach all the tyres even on large motorhomes and quick-connectors for convenience.It is also surprisingly quiet in operation, even compared to lower capacity compressors. Proven performance as used by breakdown professionals. 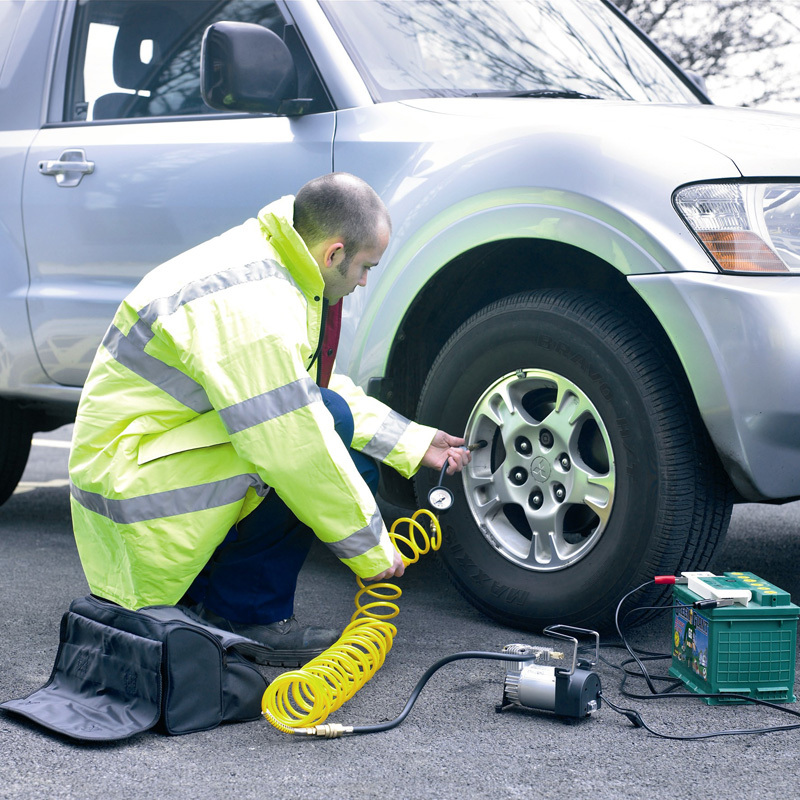 Inflates a tyre in less than 90 seconds. 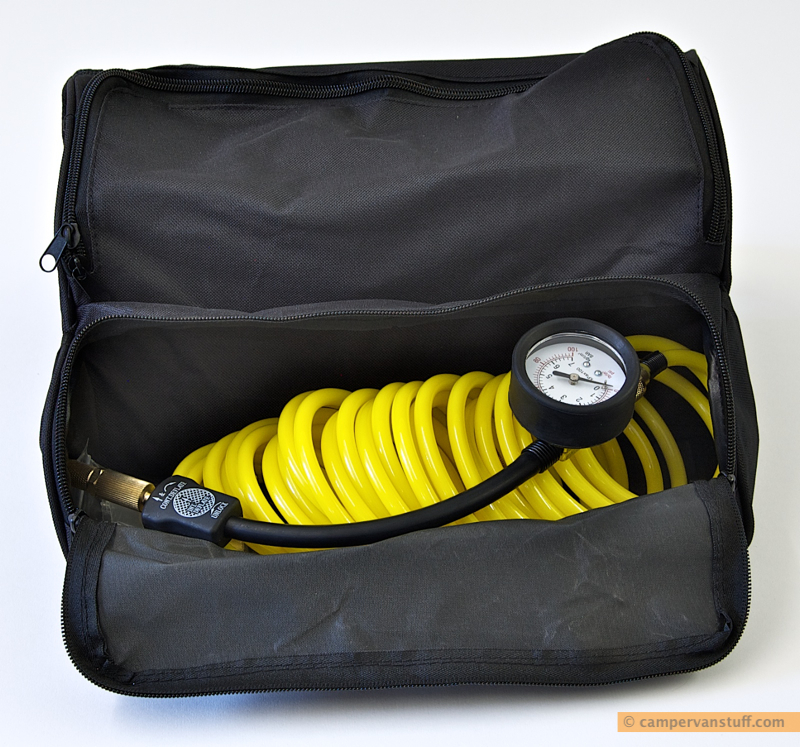 Flexible hose with quick release. Waterproof on/off switch, anti-vibration rubber mounted feet. 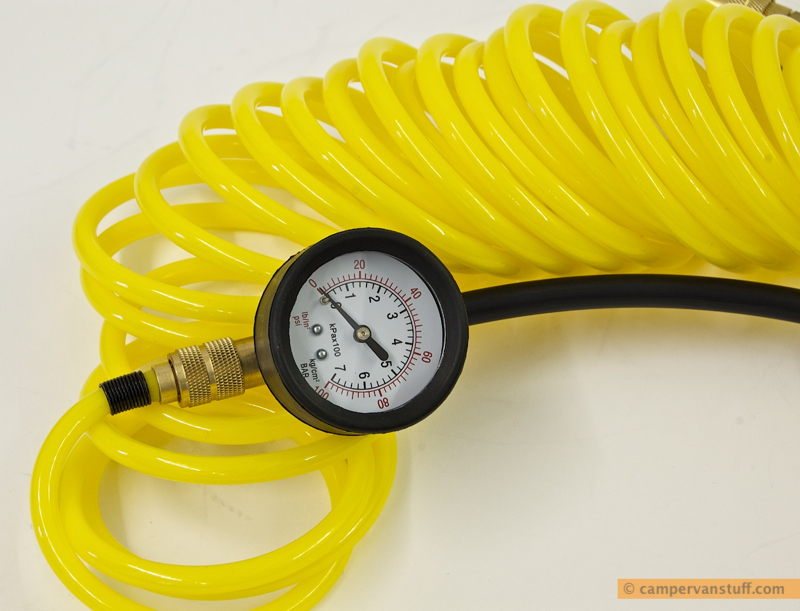 Large gradient pressure gauge - measures in PSI, bar and kg/cm2. Free 2 year guarantee (registration required). 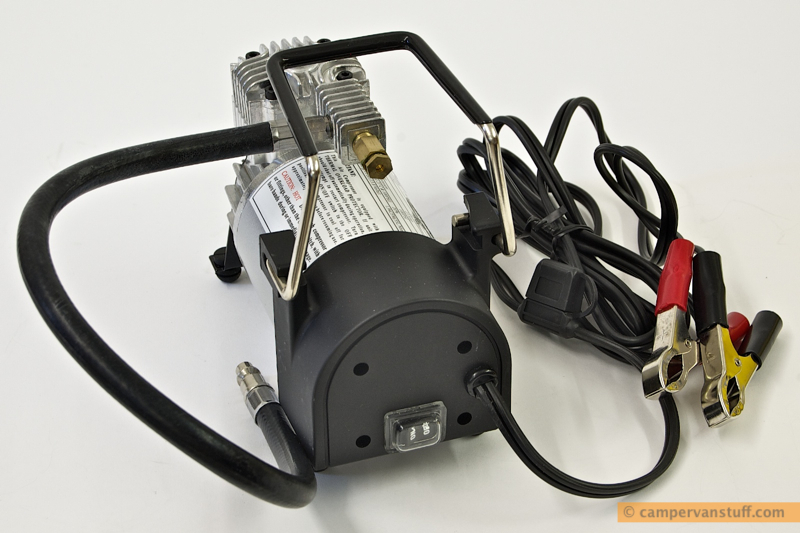 Although our smaller digital air compressor is handy to stow in smaller spaces, and the cigar lighter connector is convenient, it doesn't get near the RAC900 in overall performance. The RAC900's high power requirement means that it can't be used via a cigar lighter connection and has to be clipped directly to a battery, whether it's the vehicle battery or a portable battery. But this does confer the advantage of much great power, air flow and pressure which means speedy inflation even of large tyres such as those fitted to 4x4 vehicles, vans and motorhomes. And what's more, the combined length (9.4m) of the coiled airline and 12v cable makes it easy to reach from battery to any wheel of even large vehicles. The large gauge's specified accuracy tolerance of plus / minus 3 percent means that, for instance, a tyre inflated to 50psi should be correct to within 1.5 psi or better. For maximum accuracy the compressor should be switched off before checking the gauge and in practice we found that this is easy even though the compressor (and switch) might be a few metres away: watching the gauge whilst inflating, simply let it rise a pound or two over the desired pressure, then go over and switch off the compressor. 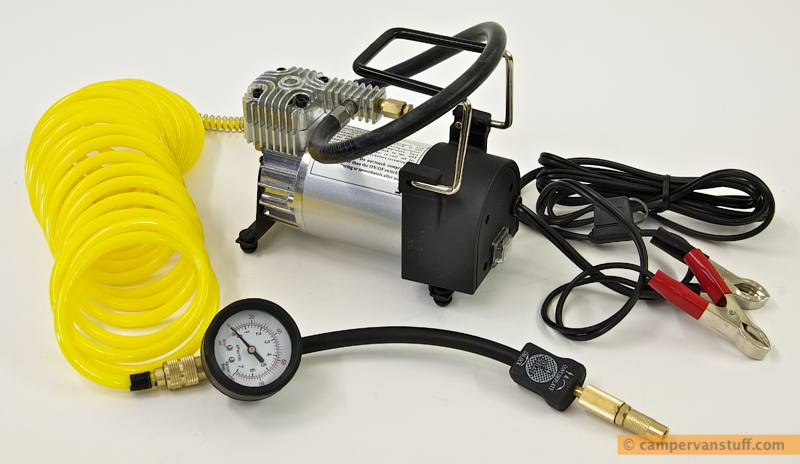 The convenient deflator which is part of the valve connector near the gauge end of the airline allows you to then release small amounts of air whilst watching the gauge, until you get exactly the reading you want. 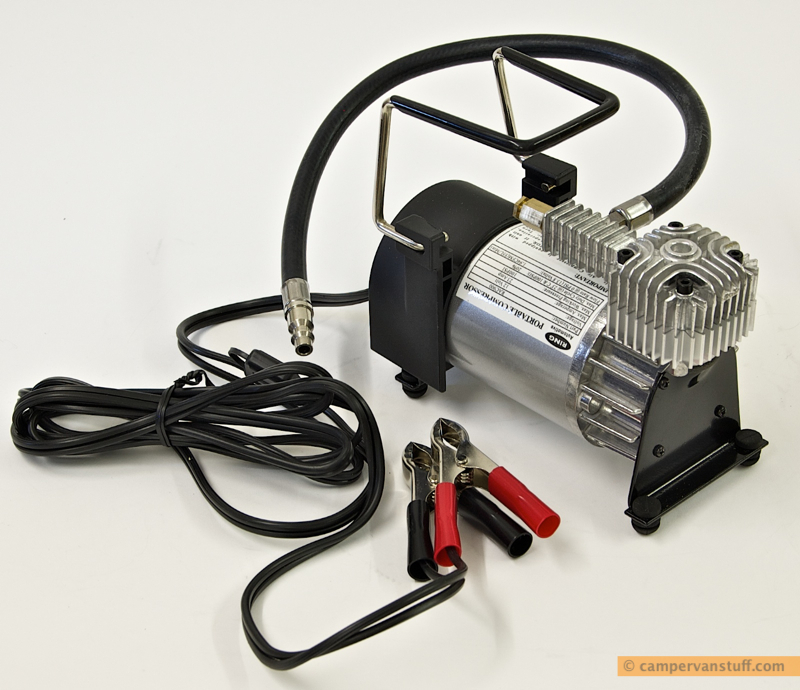 The absence of complex digital electronics also mean that there is less to go wrong and the solidly built compressor is complemented by high quality metal connection fittings throughout. We particularly like the valve connector and its high quality screw-on fitting; this has a body which is long enough to easily reach the tyre valve through the hub cab openings which on our vehicle otherwise tend to obstruct many other types of valve connector. Another view, ready to go. The coiled hose is highly flexible and stretches to 7 meters. It connects to a robust easy to read gauge which is accurate to plus / minus 3 per cent. 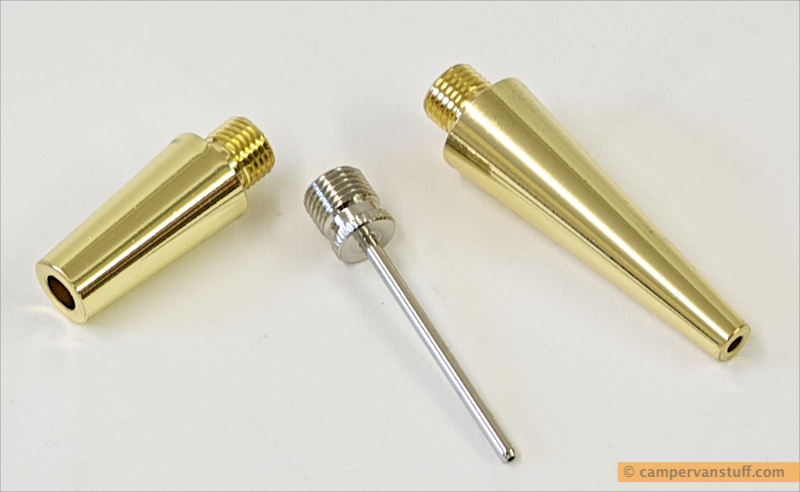 Additional metal nozzles are provided for other inflation tasks. It all fits into the supplied heavy duty bag. The bag is secured with quick realese buckles and zips. 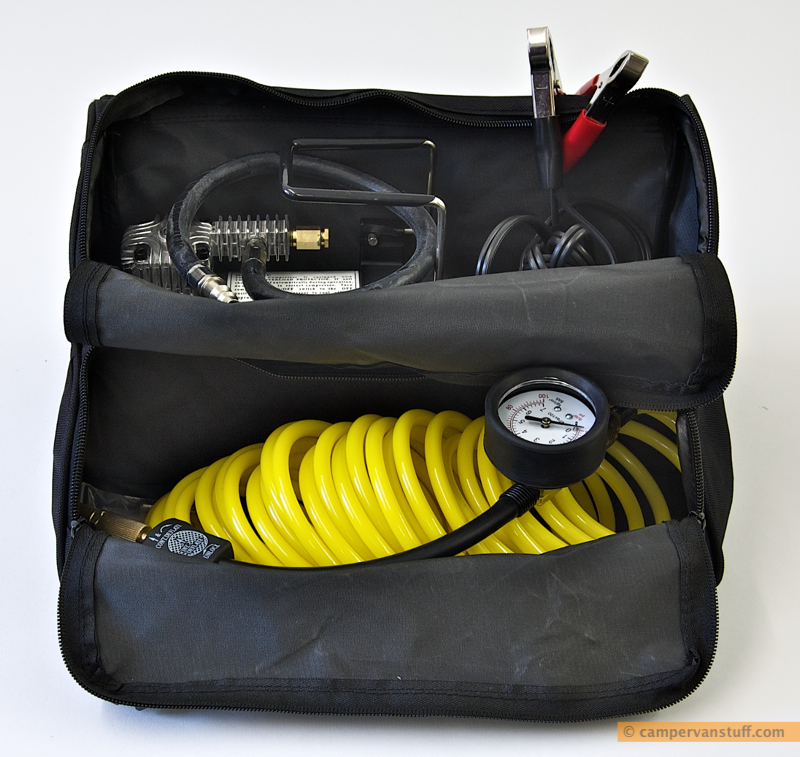 One compartment holds the hose and the gauge and tyre connector. 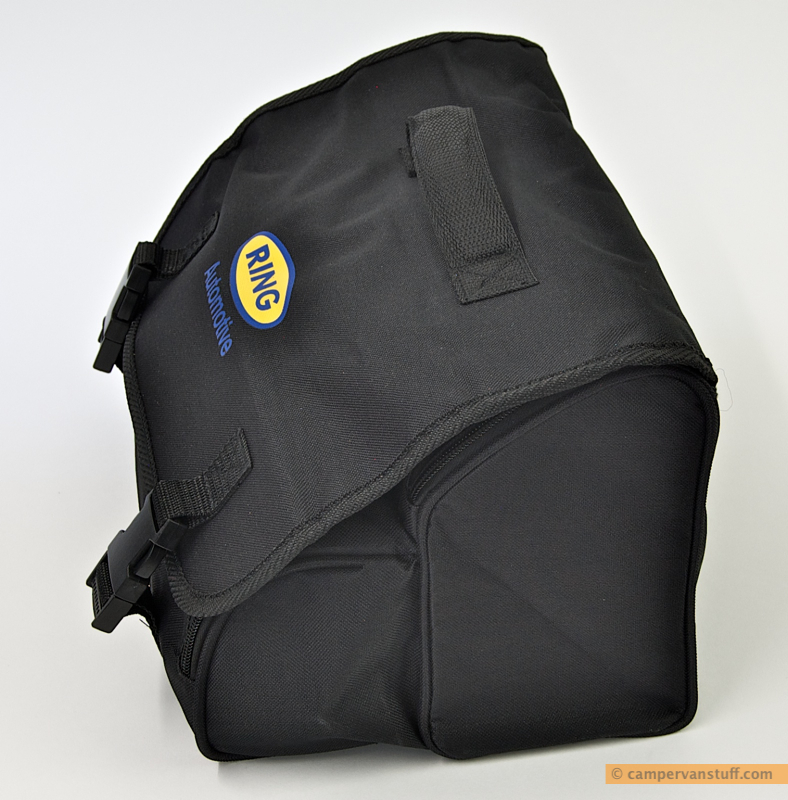 The compressor unit and 12v power cable fit neatly into the main zippered compartment.